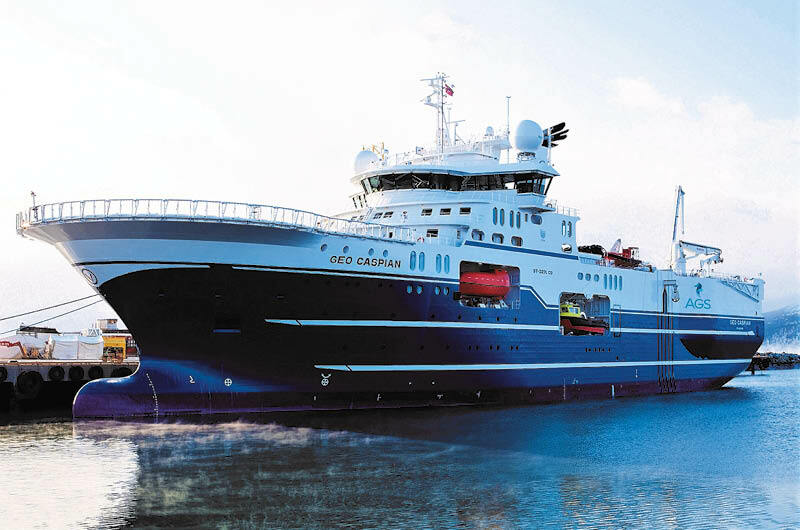 Geo Caspian – 108m multi-purpose seismic vessel capable of seismic source, streamer and high speed nodal deployment and recovery. Ocean-bottom nodal (OBN) seismic is riding something of a wave of success in the seismic acquisition market that, contrarily, has been hard hit over recent years. This was highlighted in 2017 when it was reported there were more seismic vessels deployed on seafloor or ocean-bottom (OB) surveys than in traditional marine streamer. 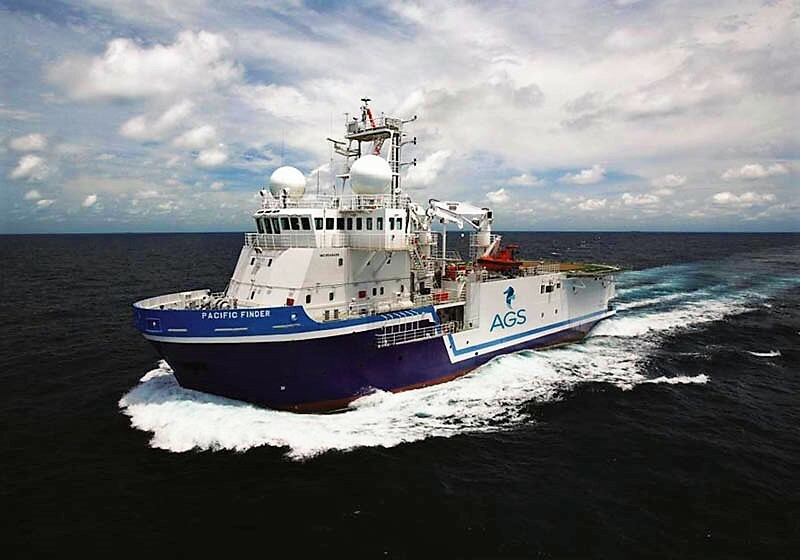 This has opened an opportunity for new companies, including Axxis Geo Solutions AS, to enter the market during this downturn, where more traditional marine streamer stalwarts appear to be exiting. There is a lot of speculation as to why OB, and particularly OBN, have been able to ride this wave despite the downturn; much of the market’s success can be attributed to several key factors. Offset distribution of an OBN survey in the North Sea. Over the past decade, we have seen widespread acceptance of what is perceived as ‘blind’ recording, both on and offshore. Broadly speaking, most nodal systems acquire data internally, and therefore do not provide the visibility to data on a real time basis, as is enabled by heritage cable, and in some cases, radio-based networked systems. This acceptance was possibly first driven by the high density source, high density receiver spreads deployed on land surveys, demonstrating the value of the very high quality data that can be acquired in this manner, and by the ability of processing to remove strong noise trains in the data without an impact of seismic data quality (in simultaneous source acquisition, for example). Ocean-bottom surveys, by their very nature, decouple the source from the receivers, thereby allowing far greater flexibility in the way surveys are designed and executed. Better illumination is achieved through long offsets and WAZ (wide azimuth), as well as high signal to noise through dense sampling and high fold, multicomponent receivers and super vector fidelity. 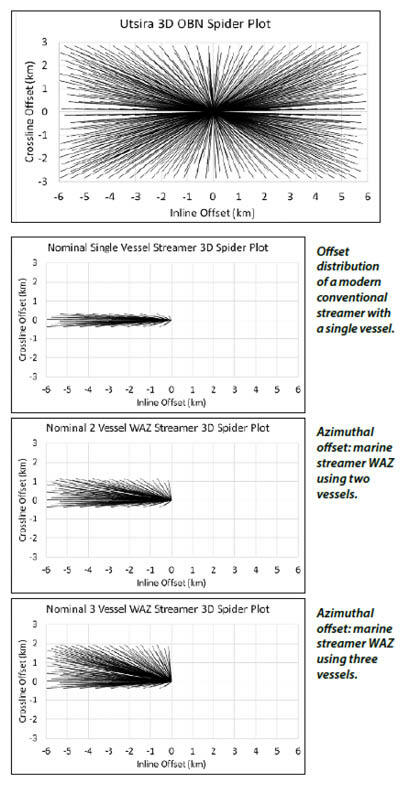 It is also clear that 4D FAZ (full azimuth) and WAZ designs are more easily achieved with nodal technology. Another benefit of OBN is that it addresses two of the major limiting factors of Full Wave Inversion, i.e. restricted offsets and bandwidth, especially in the low frequencies. AGS Pacific Finder. OBN acquisition is much more forgiving in areas of infrastructure. Surveys can be designed to optimise receiver positions in relation to oil field infrastructure, limiting the impact of the infrastructure on the data. Hybrid surveys are becoming more frequent, where nodal patches are used to complement a marine streamer survey, filling in the areas that are normally not accessible to marine streamer and therefore creating a more contiguous data set. OBN offers the ability to create unique designs and is a highly scalable solution, unhindered by the conventional constraints in both the inline and crossline directions. Efficiency is probably one of the most significant areas that has helped the uptake of ocean-bottom acquisition. Simply put, efficiency drives cost. New entrants into the market have focused on improvements in the speed of deployment and recovery of the nodes. Complementing this is the ability to deploy multiple sources that can operate independently and simultaneously (sim source), enabled by improved processing techniques that can quickly and effectively de-blend the data. A good deal of the benefits described above are due to the increasing size of the deployed spread, with a 10,000 node operation now being deployed today, compared to a little over a decade ago, when a 1,500 node survey was considered ground-breaking. Despite a typical modern OBN 3D spread having a large physical footprint, the use of acoustic pop-up buoys makes it invisible to surface traffic and activities, enabling acquisition through heavy traffic areas that would otherwise be substantially disrupted by a marine streamer operation. A modern quality OBN design can typically deliver 1,000x the data of a streamer survey, vastly superior azimuthal distribution and is now more cost effective through higher productivity enabled by simultaneous source acquisition and refinements in the node handling domain. Driven by decreasing relative cost to marine streamer and increased oil recovery focus, financial analysts and industry experts are expecting the OBS market to deliver an annual turnover of around $1 billion in 2018. Further growth expectations towards 2021, it has been suggested, could be as high as $2 billion in annual turnover. It makes financial sense. NPV hit of a misplaced well (with a well cost of ~$10MM dry hole cost) in an onshore development is commonly over $40 million, and for offshore well costs and order of magnitude, higher NPV impact is significantly greater. Poor illumination and poor imaging of structures and faults all increase the risk of misplaced wells.